Kim Kardashian and Kanye West are getting married and the battle over what kind of wedding to have has begun, according to the newest issue of US Weekly that is. The parents to baby North are reportedly planing a secret wedding but can’t quite agree on the type of wedding they want. 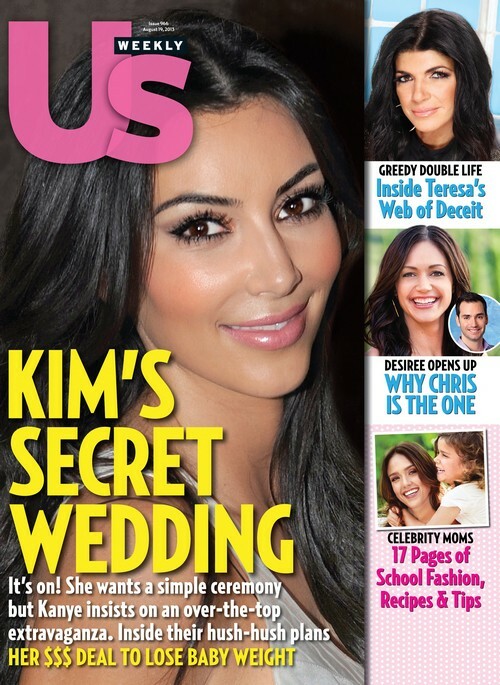 In what I find hilarious and probably true, the weekly magazine claims that Kim K wants a simple ceremony. She after all has already done the whole over the top wedding. Kanye however being the flashy over the top kind of guy that he is, wants a big extravaganza when he marries his lady love. The wedding battle is on and my odds are on Kim getting her way. There are also deets about Kardashian’s big money deal to loose the baby weight. That is not a shock Kim makes money off of everything she does. Anyone want to take bets on whether or not she will make more cash then Jessica Simpson did with her Weight Watchers deal? Other stories in the most recent issue include of course The Bachelorette Desiree and her new fiance’s Chris. Why she chose him over Drew, which if you watched the show you already know that but perhaps this article will tell us how her feeling for Brooks weighed in on her decision. I still find it a little hard to believe she is going to marry Chris considering how devastated she was about Brooks. The other hot topic for the week is the double life of The Real Housewives of New Jersey’s Teresa Giudice. The magazine gives an inside look into her greed and web of deceit that now has landed her and her hubby in some serious hot water, juicy. US Weekly has some really good stuff this week, which story are you looking forward to reading the most? Tell us your thought in the below comments section.